Heat a large dutch oven or frying pan and add 4-6 tbsp clarified butter or vegetable oil. Sauté finely chopped white onion or shallots, finely chopped celery, and finely chopped red pepper until translucent. Add a generous tbsp of parsley, fresh or dried rosemary to taste, scant sprinkle of poultry seasoning, chili flakes and approximately ½ t salt. The ingredients and amounts may be adjusted to taste and preference. Add the rice and combine, loosely stuff the cavity of your turkey and place remainder of stuffing into a casserole dish to heat up 1 hour before your meal is ready to serve. 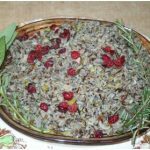 About 20 minutes before serving add dried cranberries to taste, cover the casserole dish and the steam from the stuffing will plump up the berries. Roasted pine nuts tossed on top just before serving is another option.